Posts download the application form from the official website of Salem District Recruitment is www.salem.nic.in. The last date for submitting the application form with relevant documents is 16-10-2018. The candidates will be shortlisted based on merit in written test/ interview. 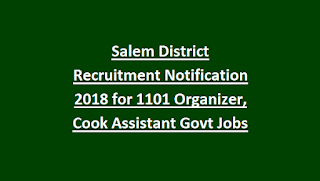 For more details of age limit, salary, available vacancies and how to apply are given below for the Organizer, Cook Assistant Posts in Salem District Recruitment Notification 2018. 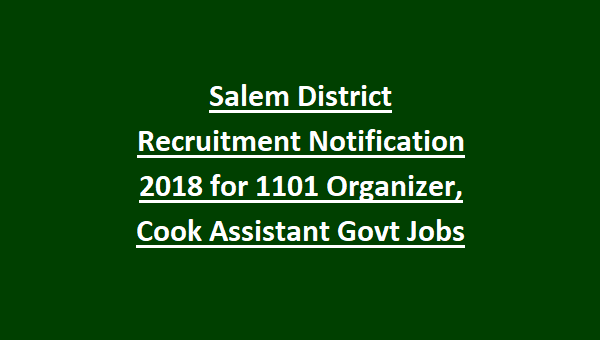 There are totally 1101 available vacancies for Organizer, Cook Assistant Posts in Salem District Recruitment 2018. The age limit for the Candidates applying for Organizer posts is in between 21 – 40 years. The age limit for the Candidates applying for Cook Assistant posts is in between 18 – 40 years. The educational qualification for apply for these jobs is candidates should have completed the 10th/ 12th/ Graduation. For more information candidates can refer in the official notification. The salary offered for the selected candidates for the Organizer post is Rs.7700 – 24200/-. The salary offered for the selected candidates for the Cook Assistant post is Rs.3000 – 9000/-. For the application fee candidates can check in the official notification of Salem District Recruitment. The candidates will be shortlisted on the basis of merit in written exam/ interview. Candidates will check in the official notification for the exam pattern and syllabus. Interested candidates can apply for the Organizer and Cook Assistant Posts through offline mode. The applicants can download the application form from the official website of Salem District is www.salem.nic.in. After download the application form fill with necessary information and send the application form to the address of Respective School Noon Meal centers, Salem District, Tamil Nadu along with the relevant document. The last date for submitting the application form is 16-10-2018.For other information of how to apply is candidates will refer in the official notification. Candidates can download the application form from the official website of Salem District is http://www.salem.nic.in/.